Hardtack is thick cracker made of flour, water, and sometimes salt. When properly stored, it will last for years. 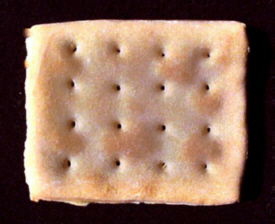 Before the American Civil War, soldiers called it biscuit or hard bread, sailors referred to it as sea biscuit or pilots bread, but to the Union Army of the Potomac during the American Civil War, it was known as hardtack, a name that stuck and spread to other units, including the Confederacy, but the name hardtack seems to have not been in general use among the armies of the West. Because it could be prepared cheaply and would last so long, hardtack was the most convenient food for soldiers, explorers, pioneers, or anyone else who needed to be able to pack light and move fast. While hardtack was furnished to the army by weight, the biscuits were doled out to soldiers by number. In some units, a ration of hardtack was nine, while it was ten in others, but there was usually enough to go around because some soldiers would refuse to eat it. Although it was nutritious, soldiers complained that they could eat ten of them in a short time and still be hungry. But the most common complaint was that they were often so hard that they couldnt be bitten into, that it took a very strong blow even to break them. Another common problem with hardtack was when they were moldy or wet, as sometimes happened. It has been suggested that this occurred when they were boxed too soon after baking, or due to exposure to the weather. Sometimes they became infested with maggots or weevils during storage, conditions that seldom afflicted the harder variety. When the hardtack was moldy or moist, it was thrown away and made good the next time that rations were issued, but soldiers usually had to put up with insect infestations. According to accounts, it was not uncommon for a soldier to find his coffee swimming with weevils after the hard bread was broken up in it; but they were easily skimmed off. Hardtack was eaten by itself, or crumbled into coffee. Probably more were eaten that way than in any other, as they were usually eaten as breakfast and supper, but there were other ways to prepare them. Sometimes they were crumbled into soups, which they served to thicken. Some soldiers crumbed them into cold water, then fried the crumbs in the juice and fat of meat, creating a dish that was known as skillygalee or cush. Some preferred to eat them toasted, either to more easily crumb them into coffee; or in the rare case when it was available, with butter. A few who managed to save a portion of their sugar ration spread it upon the hardtack.